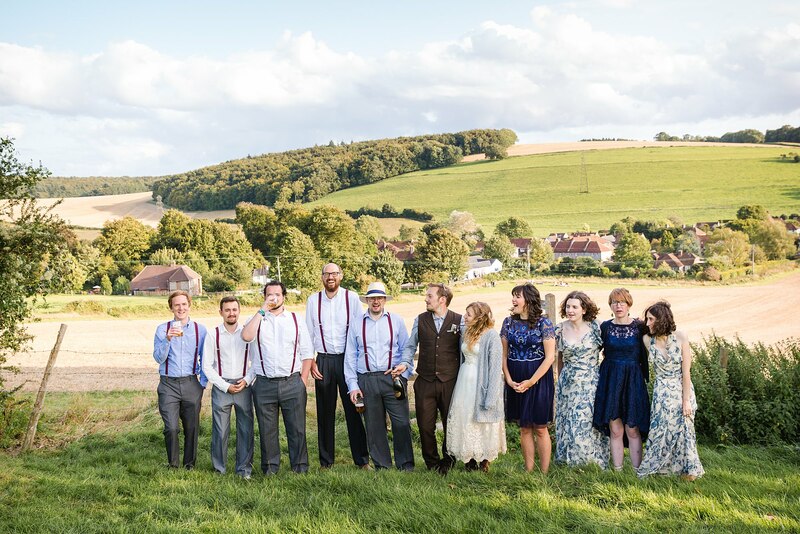 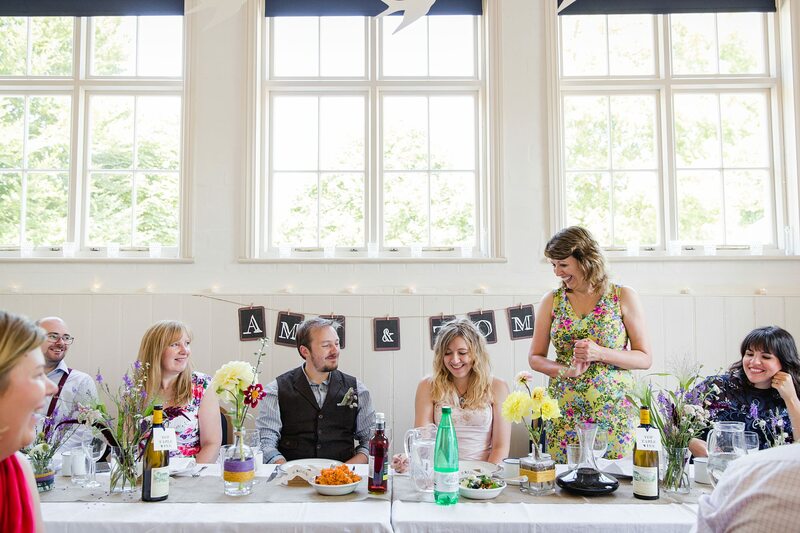 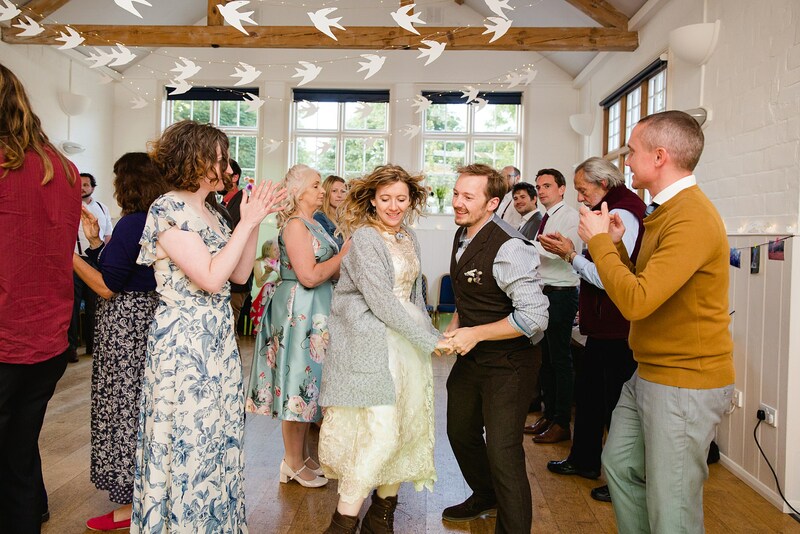 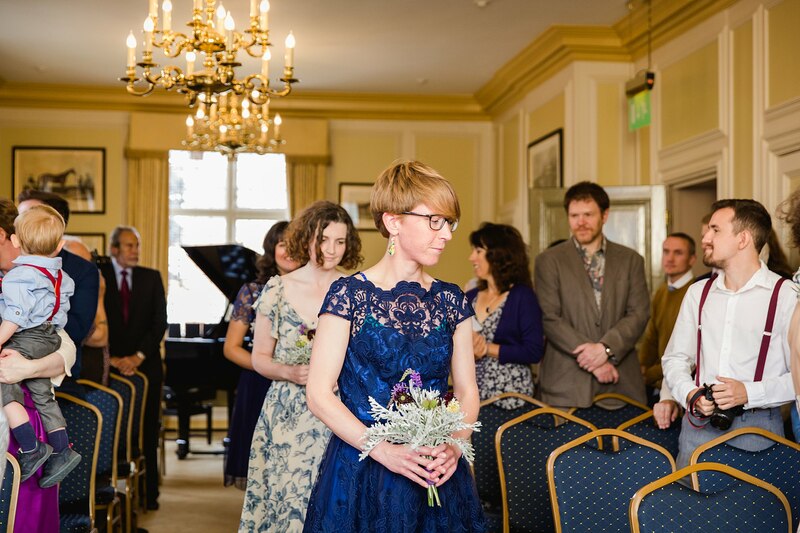 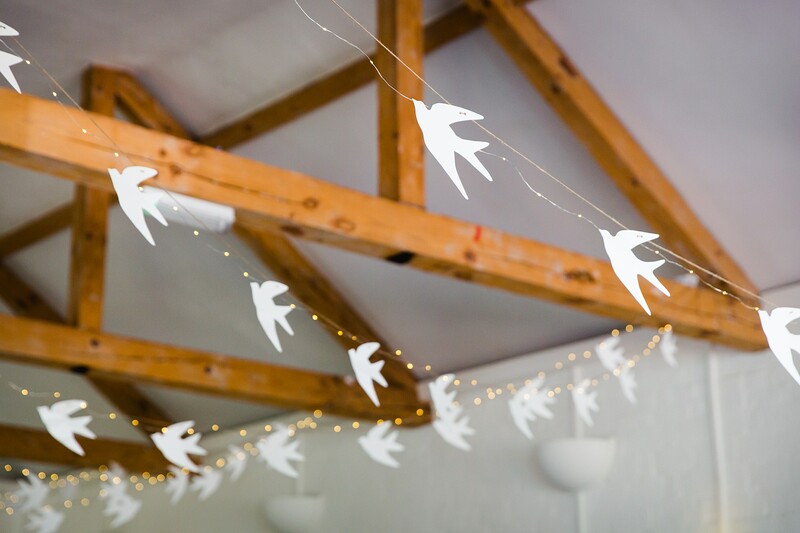 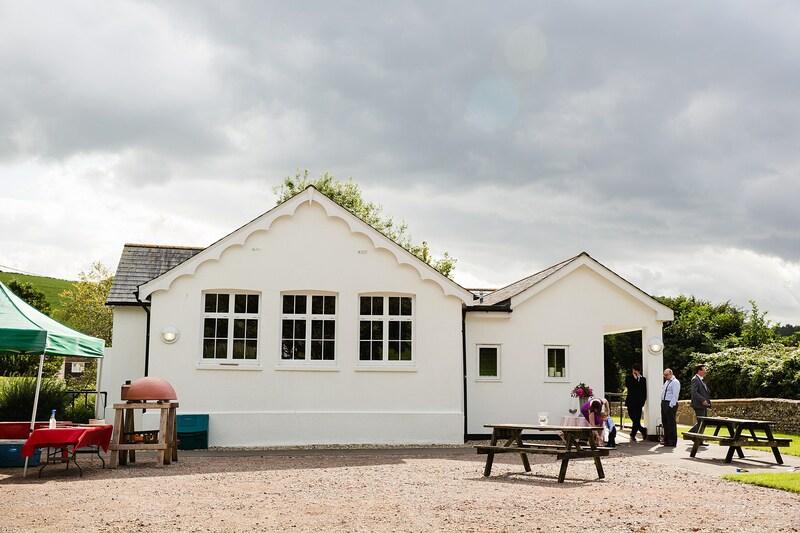 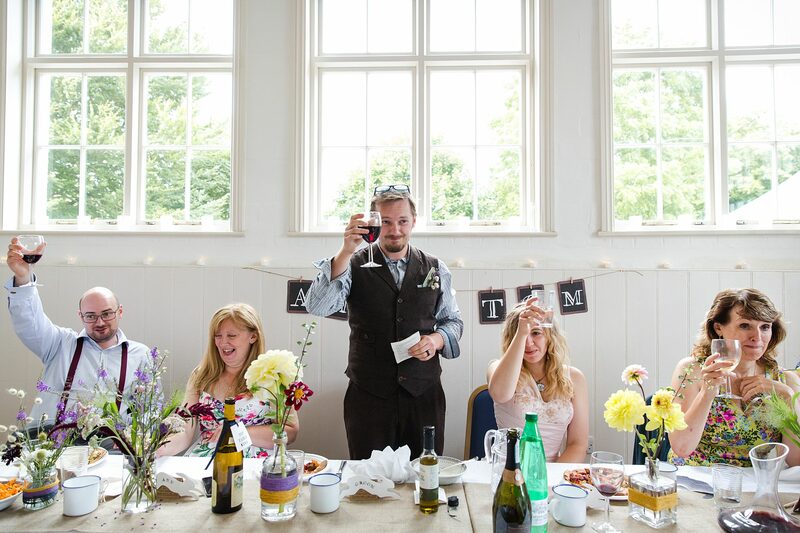 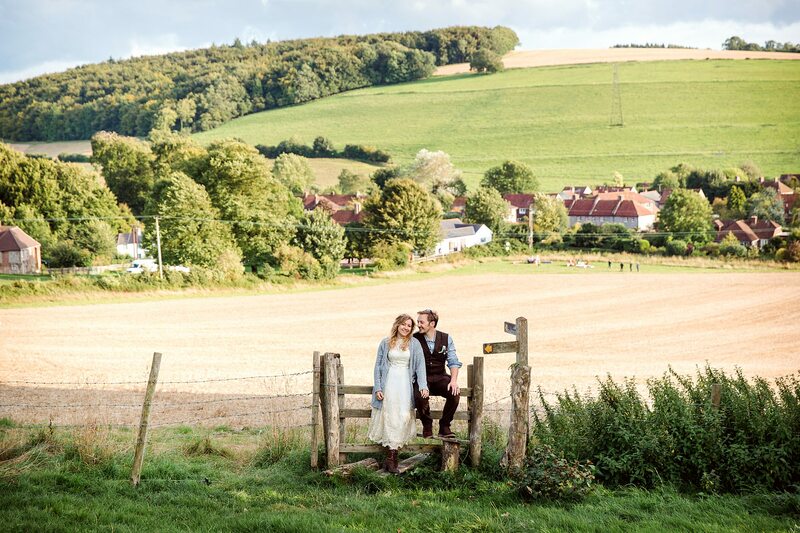 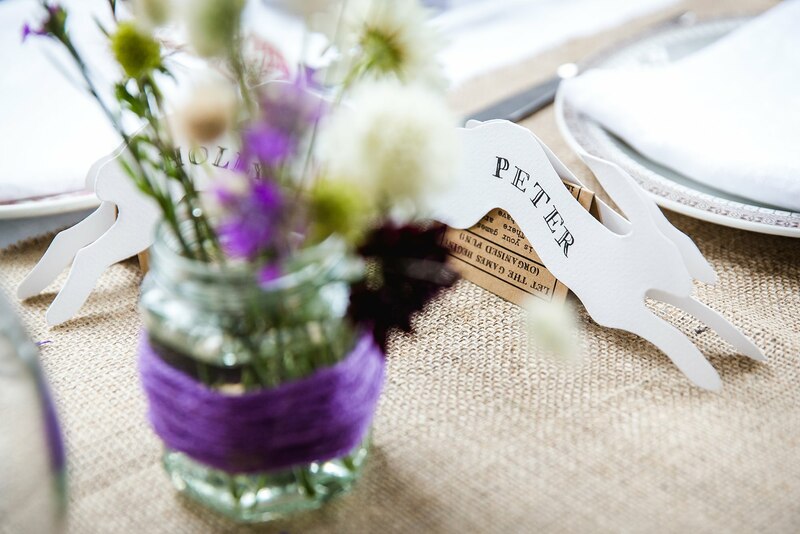 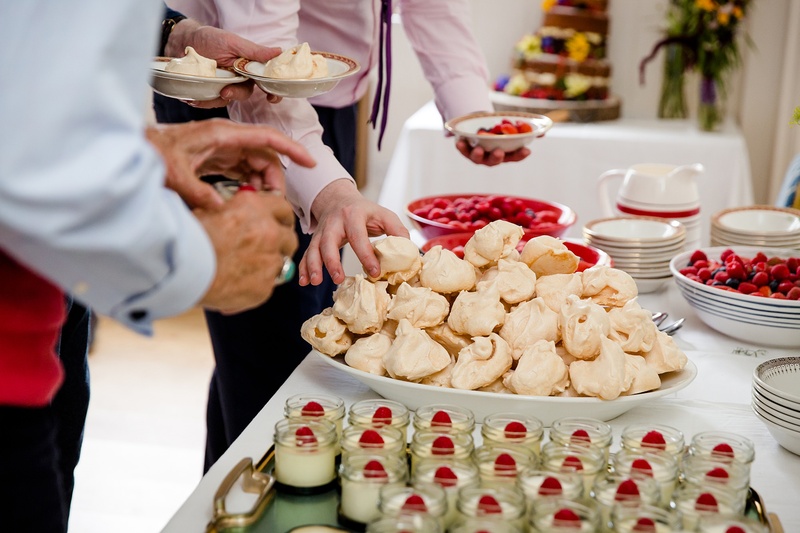 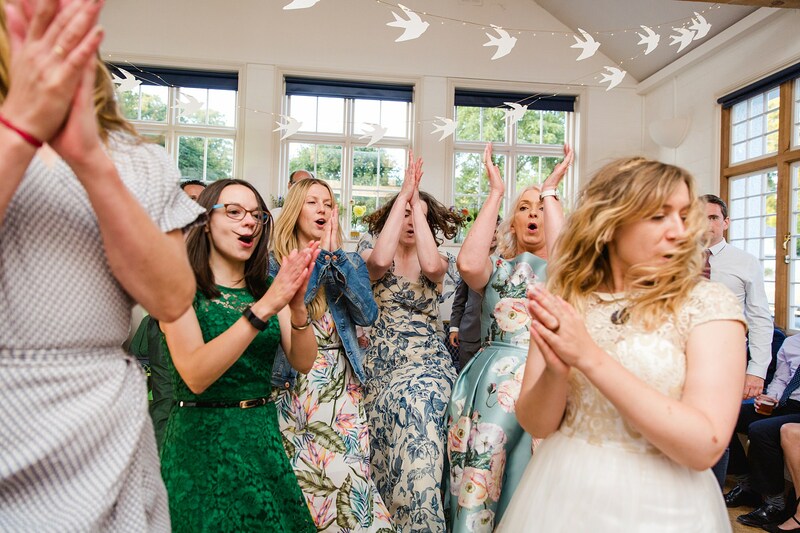 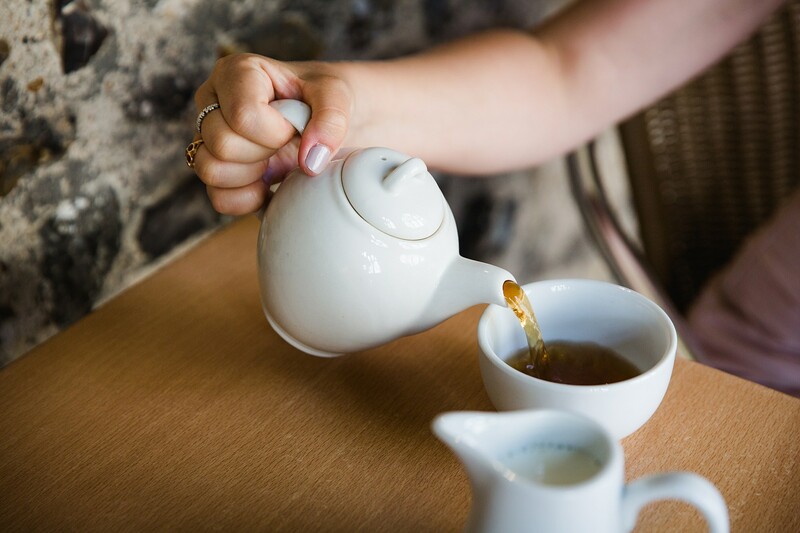 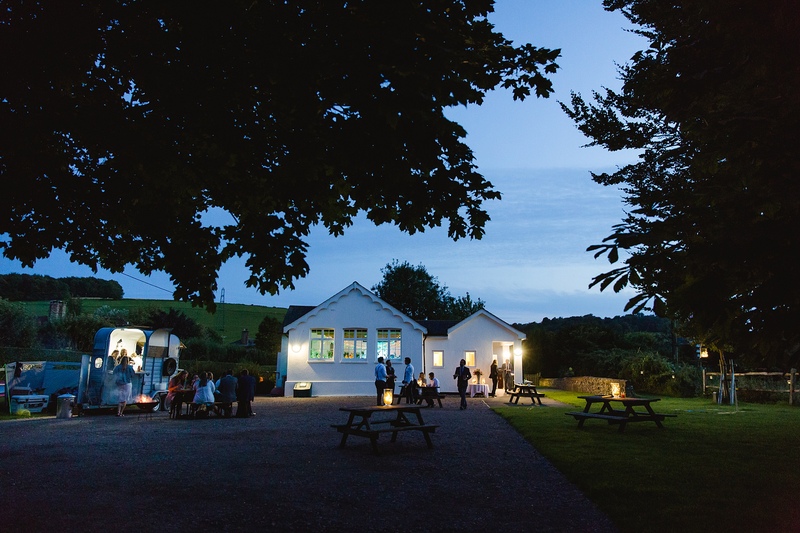 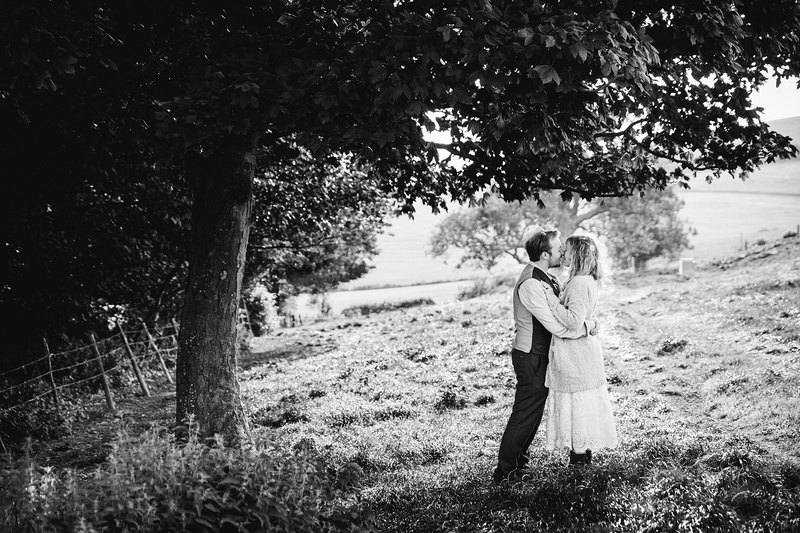 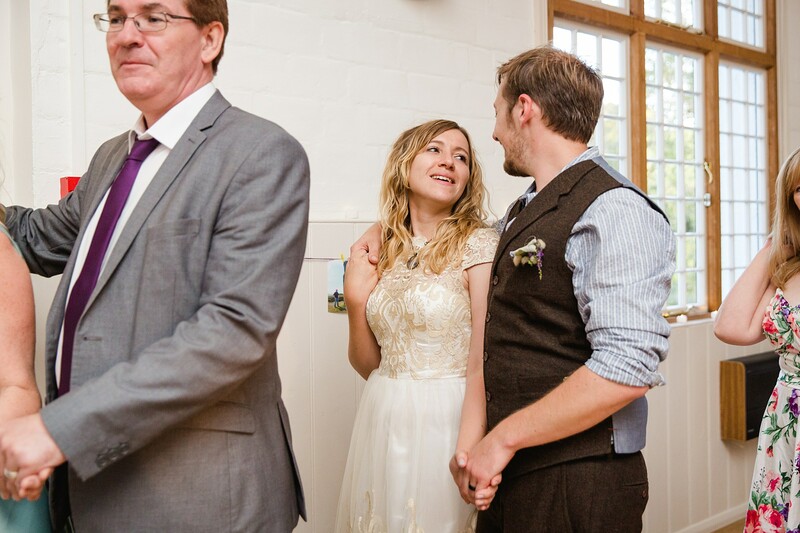 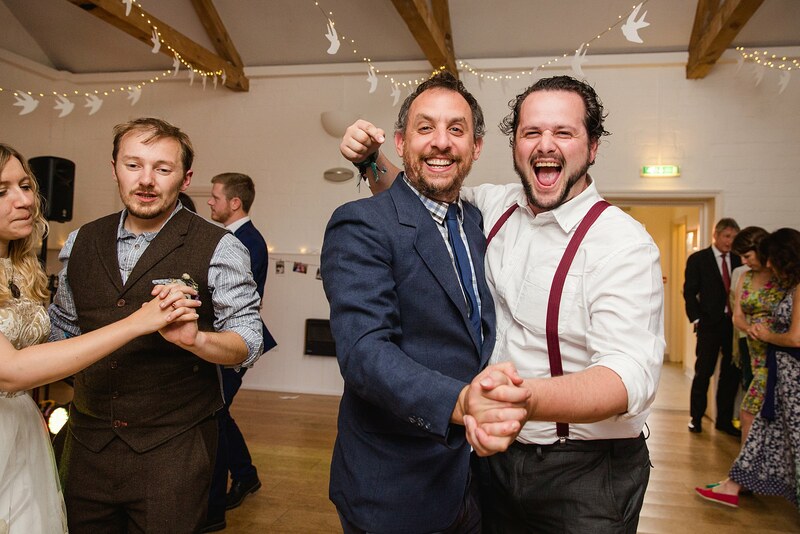 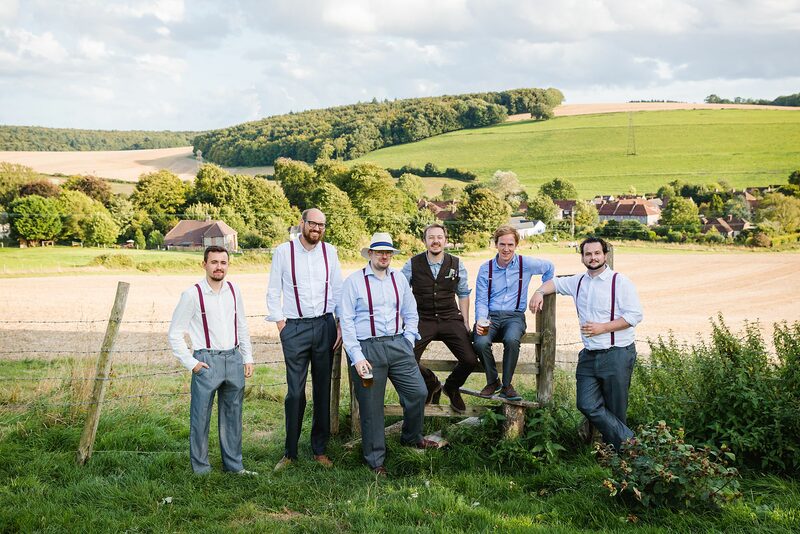 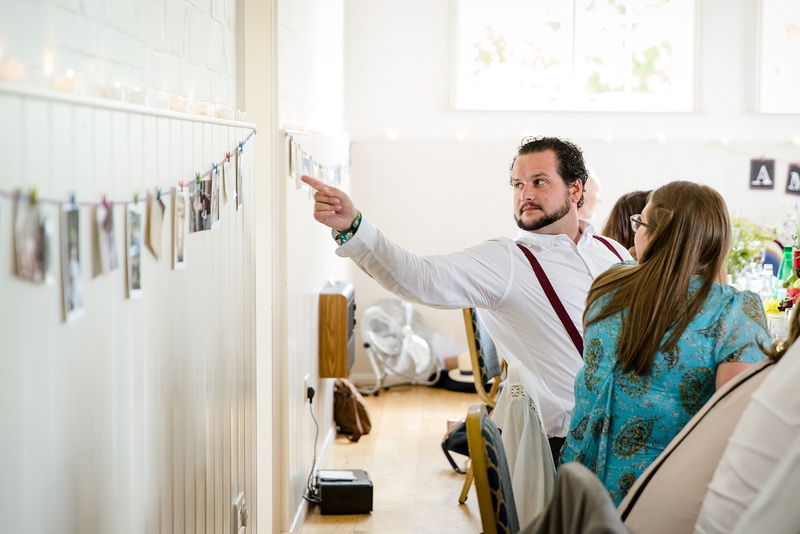 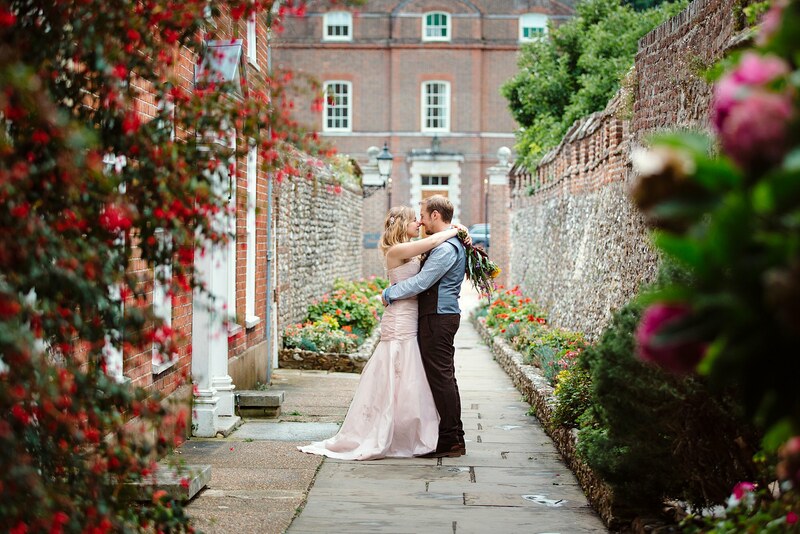 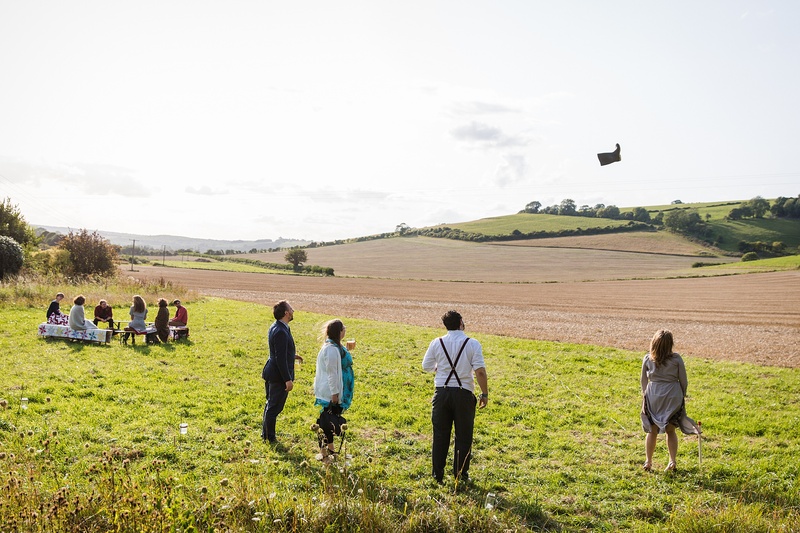 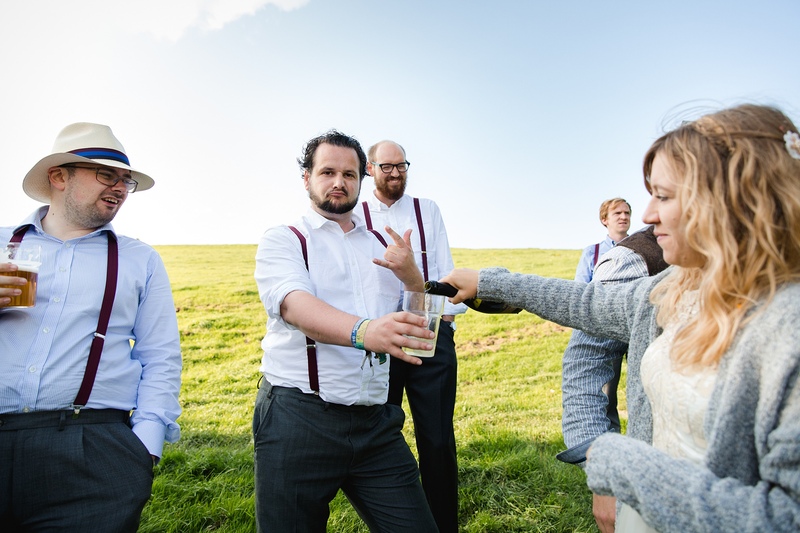 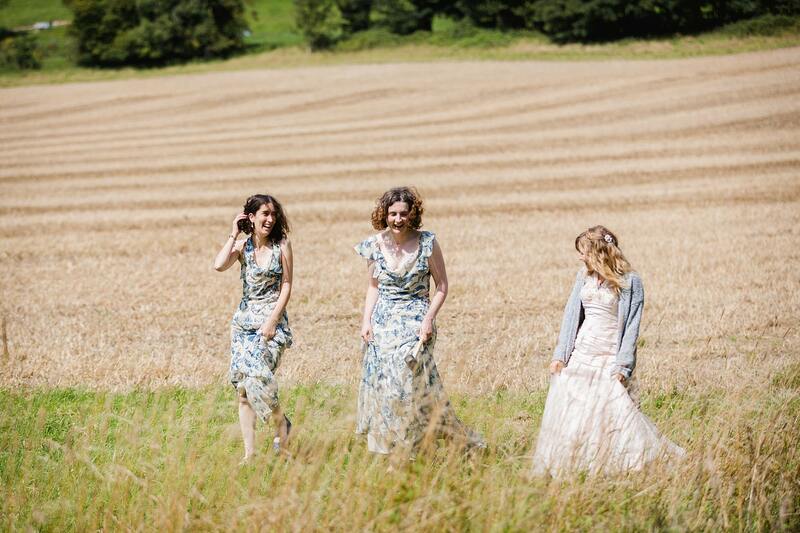 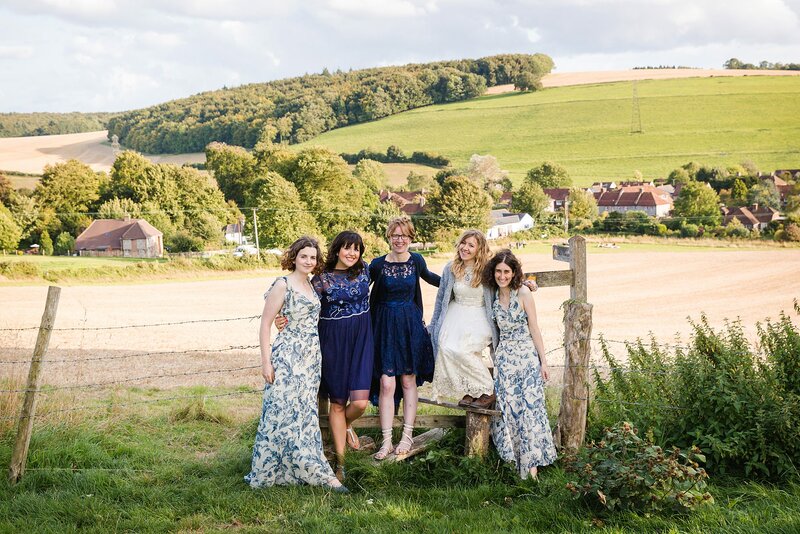 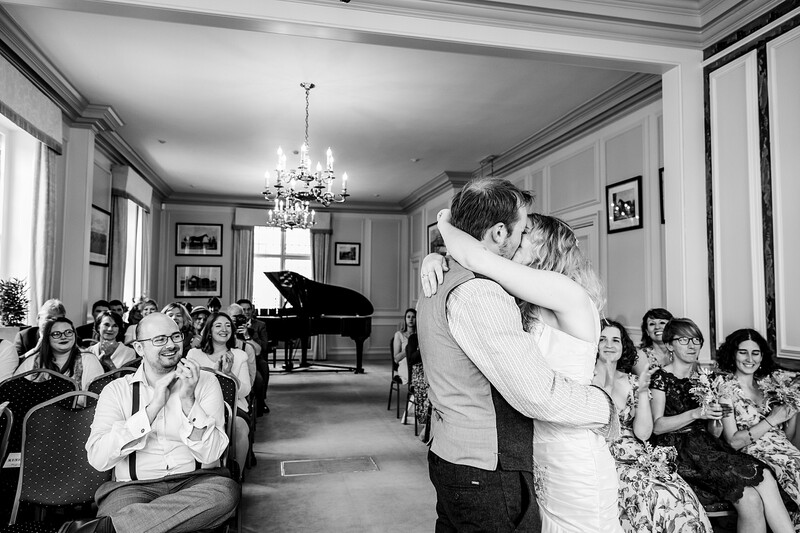 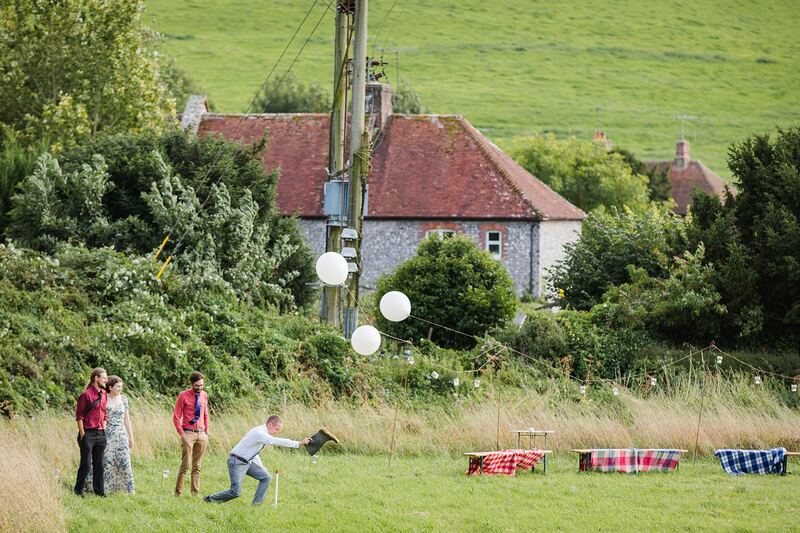 Fun village hall wedding – Amy and Tom’s laid back DIY wedding with handmade food, garden games, score cards, a pizza van and some stunning countryside views at East Dean village hall. 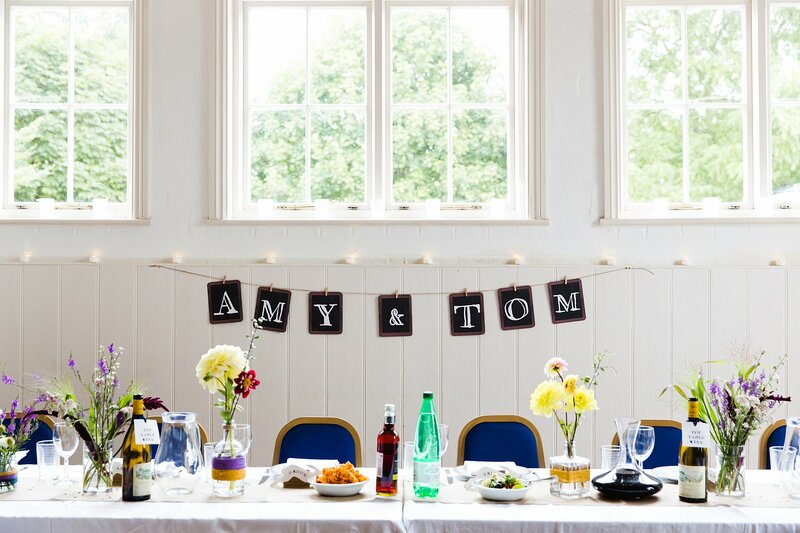 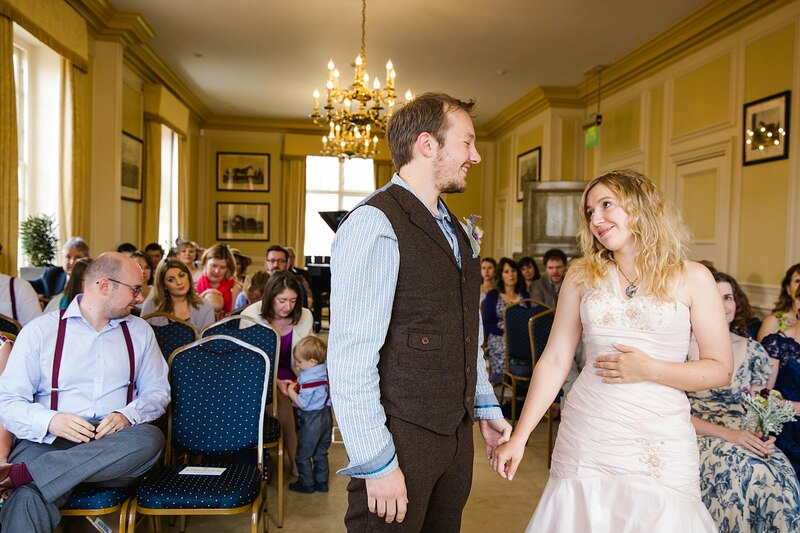 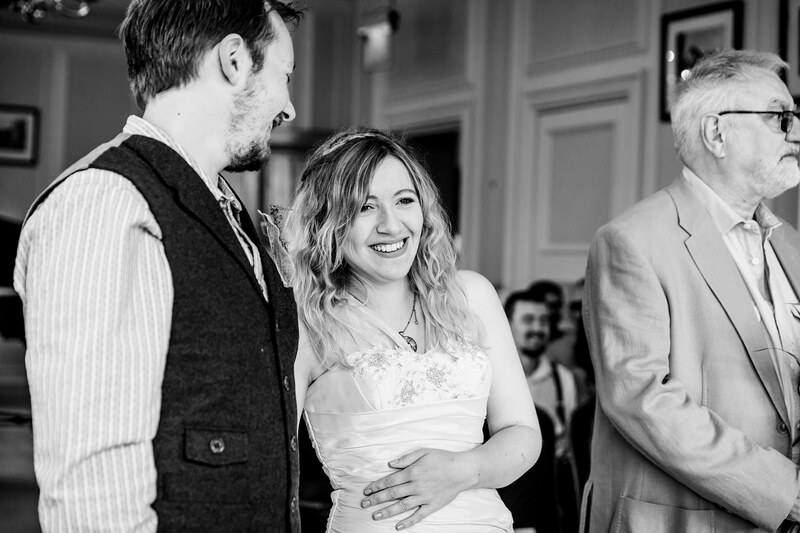 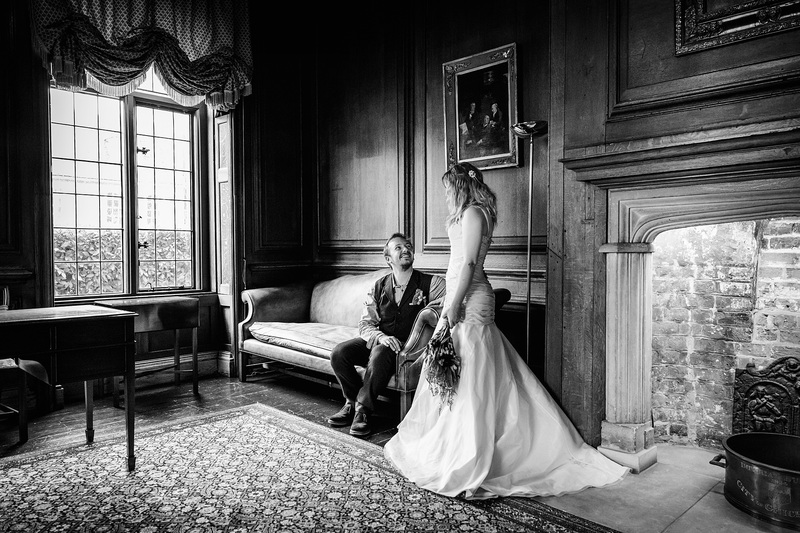 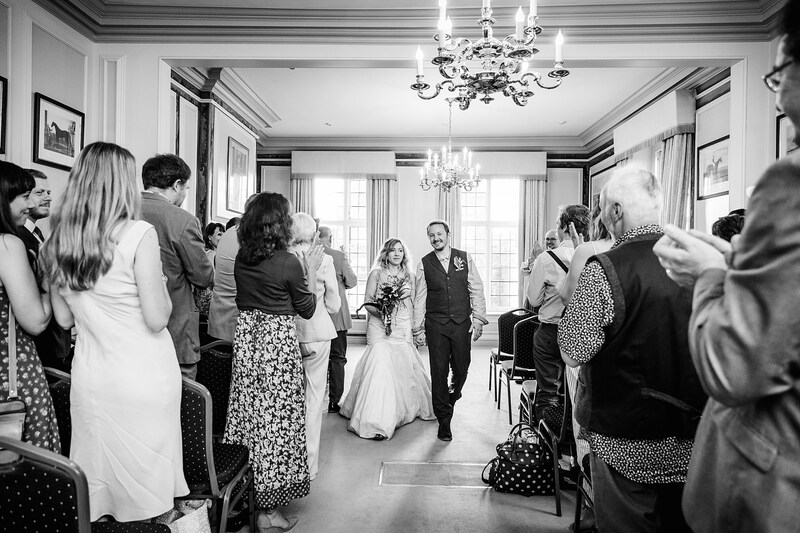 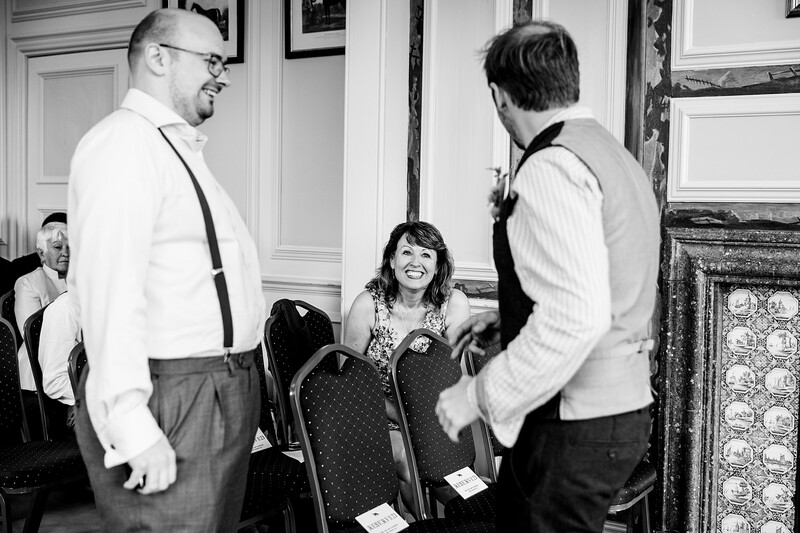 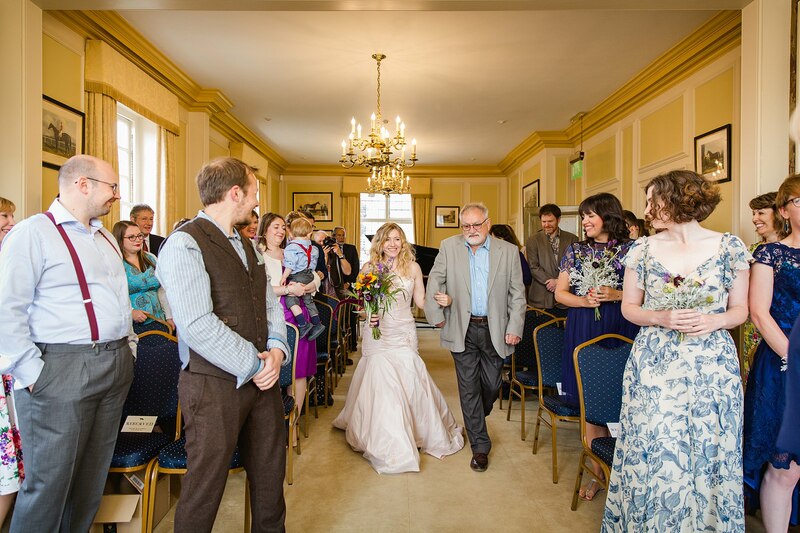 Amy and Tom were all about the fun wedding pictures – they didn’t want many pictures of the “stuff” or “formality” at their wedding, just loads of images of their families and friends having fun. 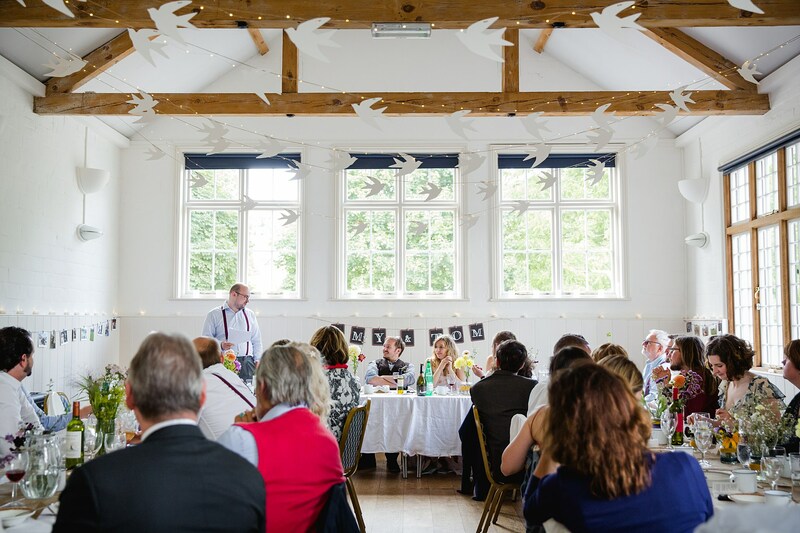 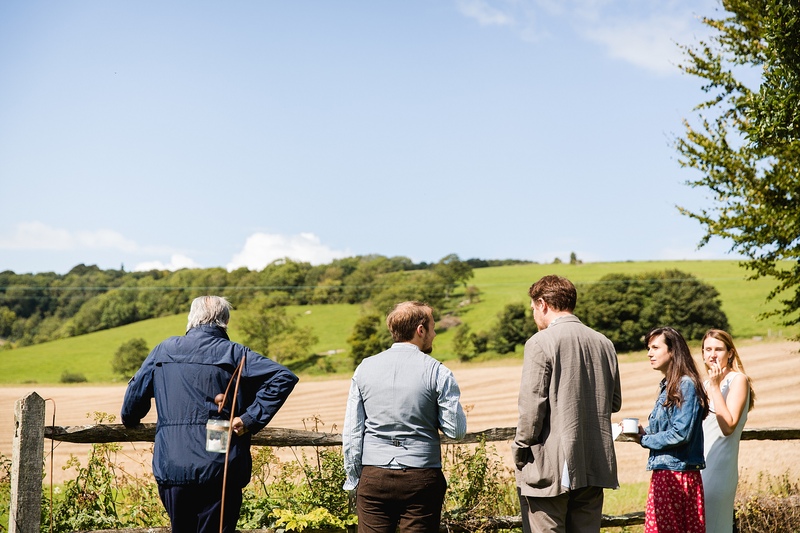 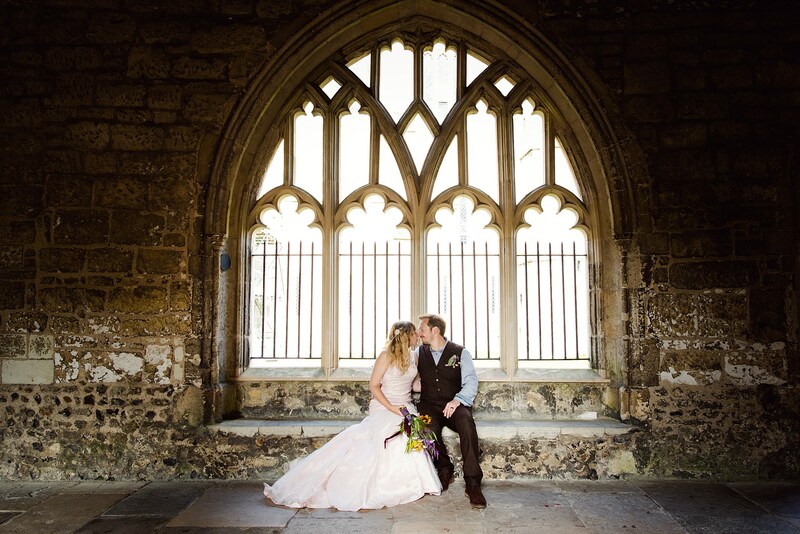 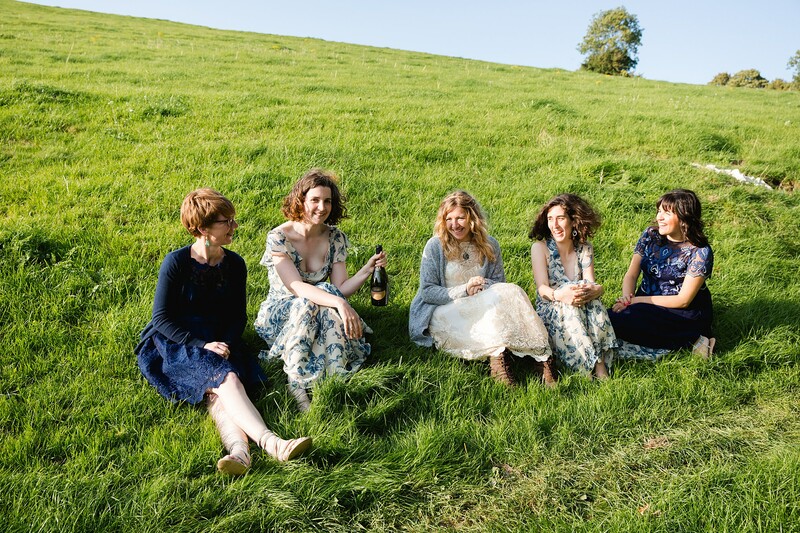 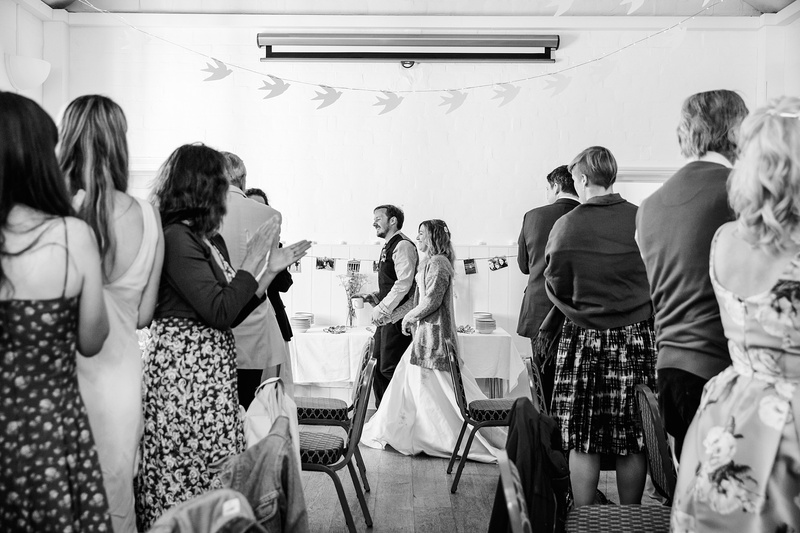 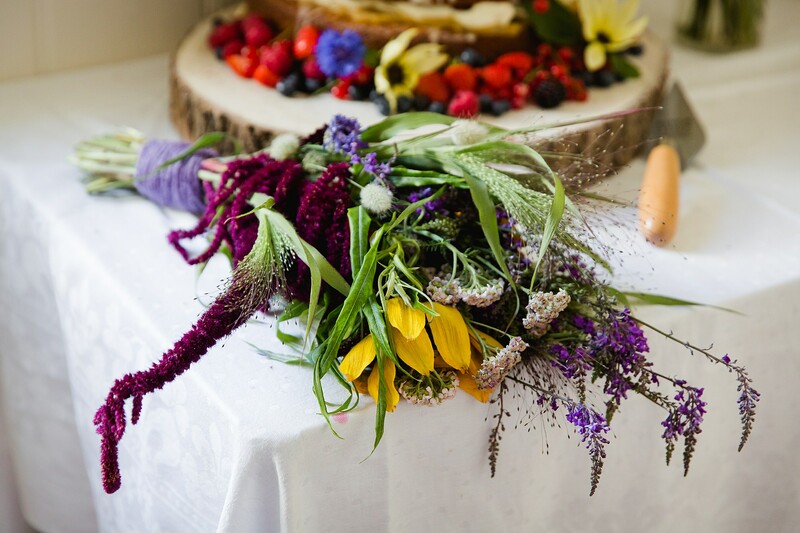 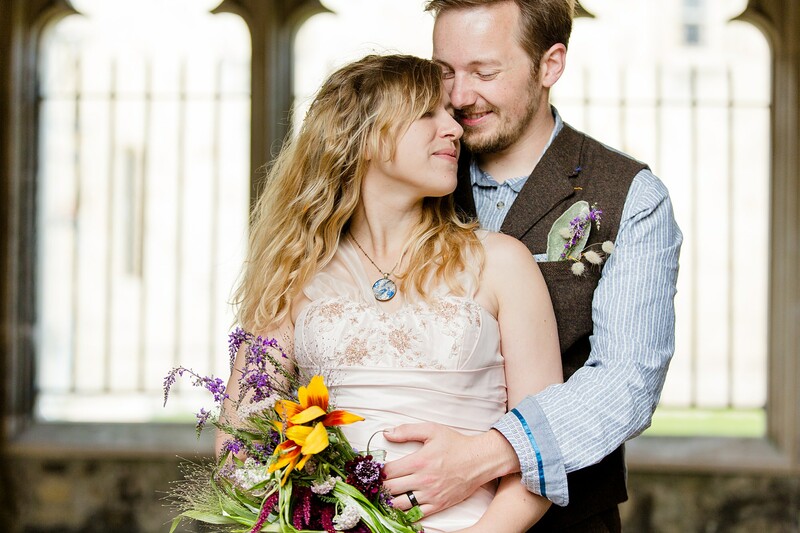 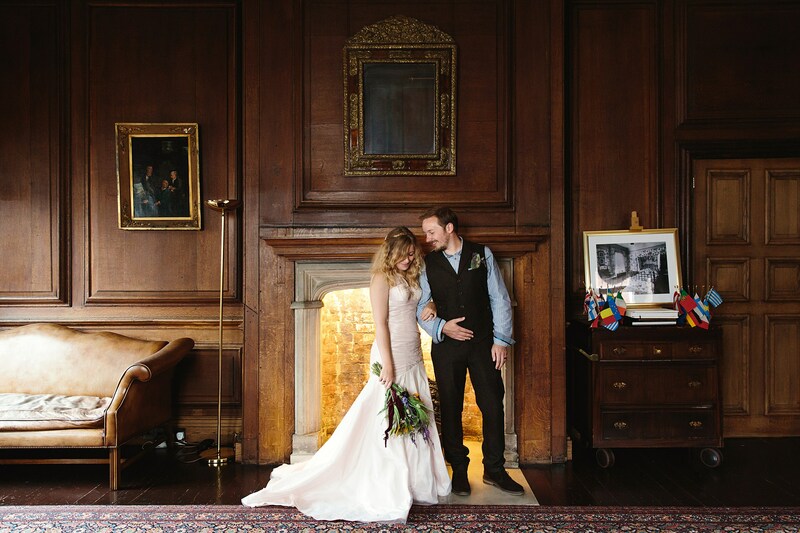 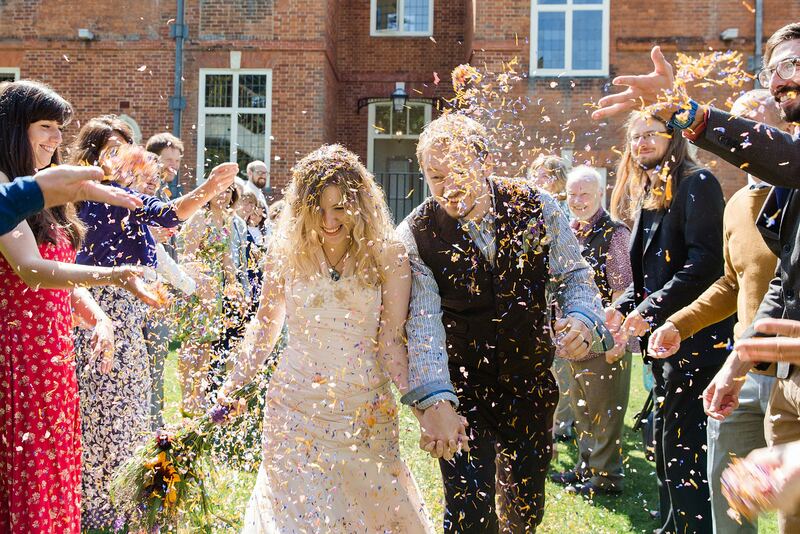 Since they were having a completely DIY wedding, they hired out East Dean village hall in West Sussex and decorated it themselves. 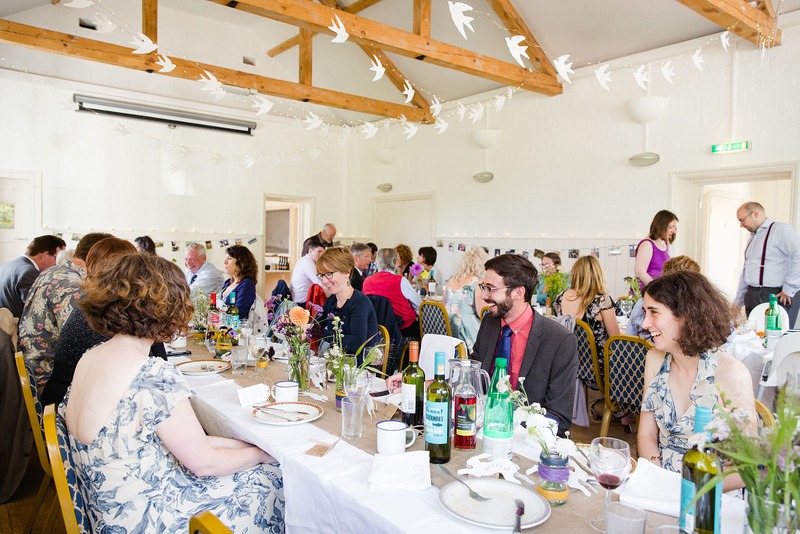 They hired a pizza truck for the main part of their wedding meal, and also handmade a lot of salads and delicious looking desserts so guests were all able to sit and share food together. 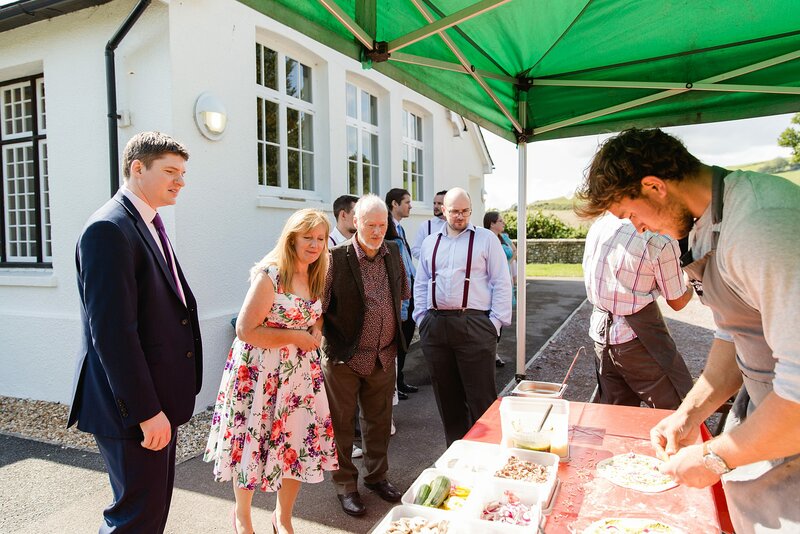 Everyone in their families and wedding party pitched in to help – from serving the pizza to the washing and clearing up! 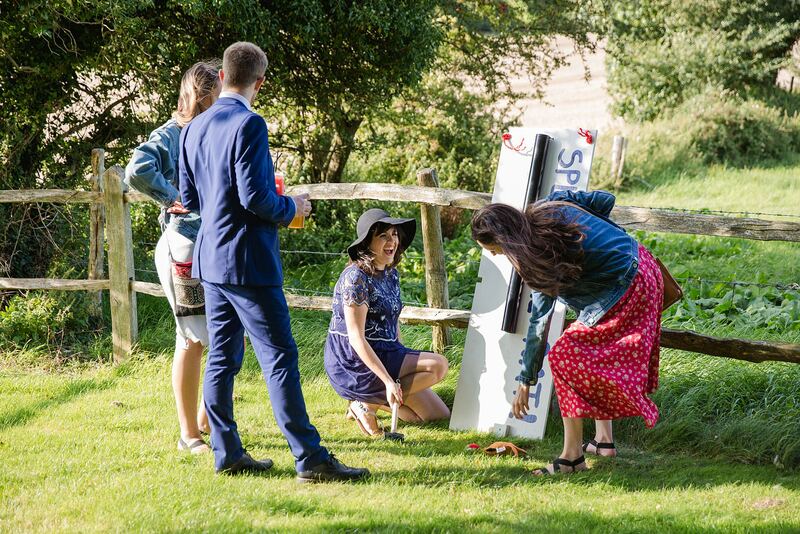 Amy and Tom put on a lot of fun garden games for their guests to enjoy, and encouraged everyone’s competitiveness with scorecards for each game. 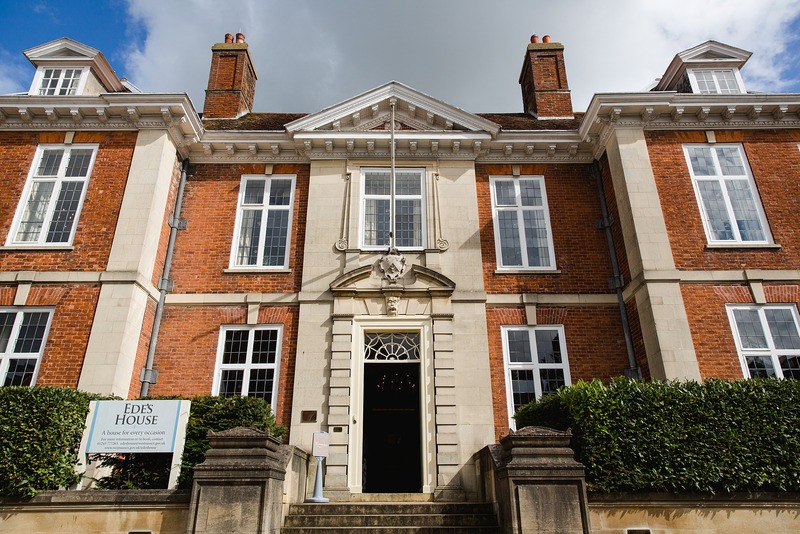 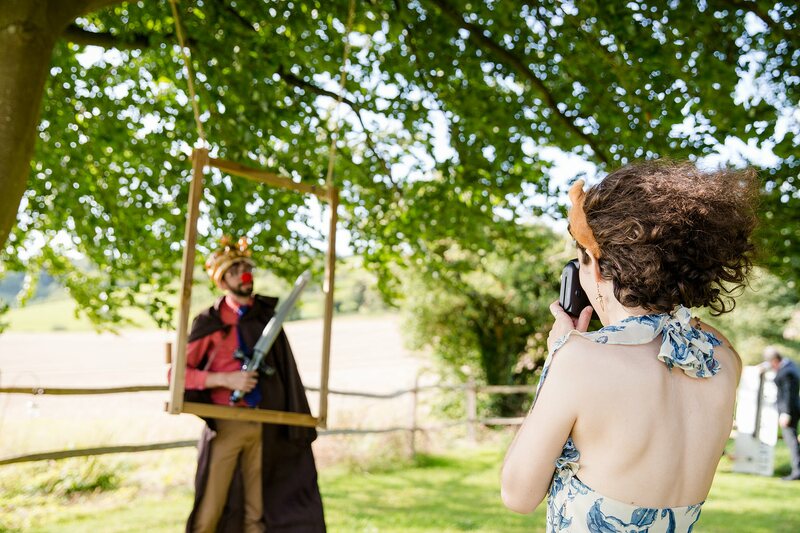 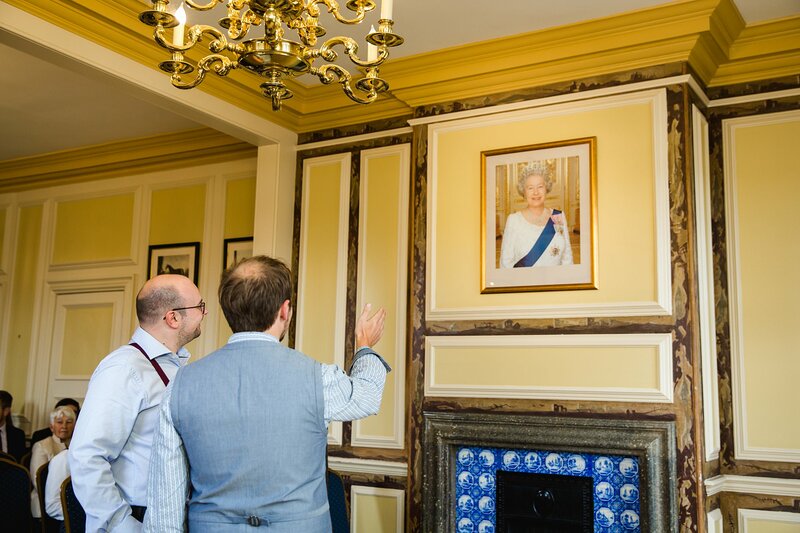 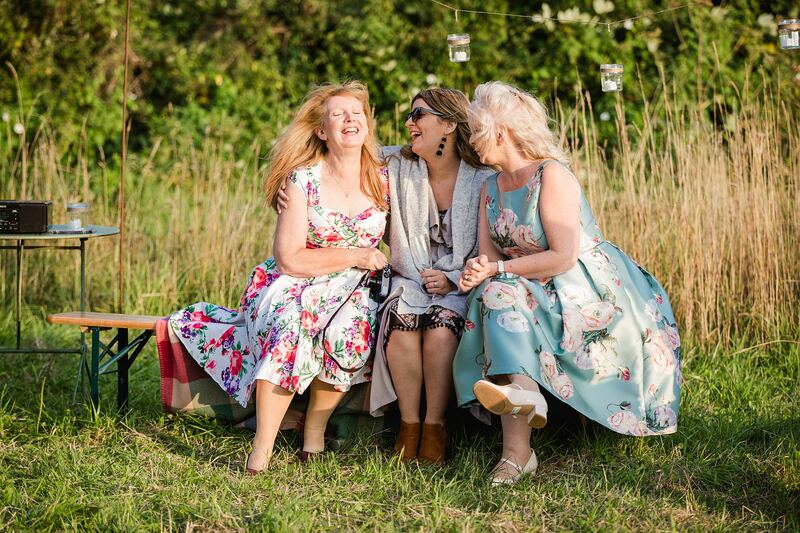 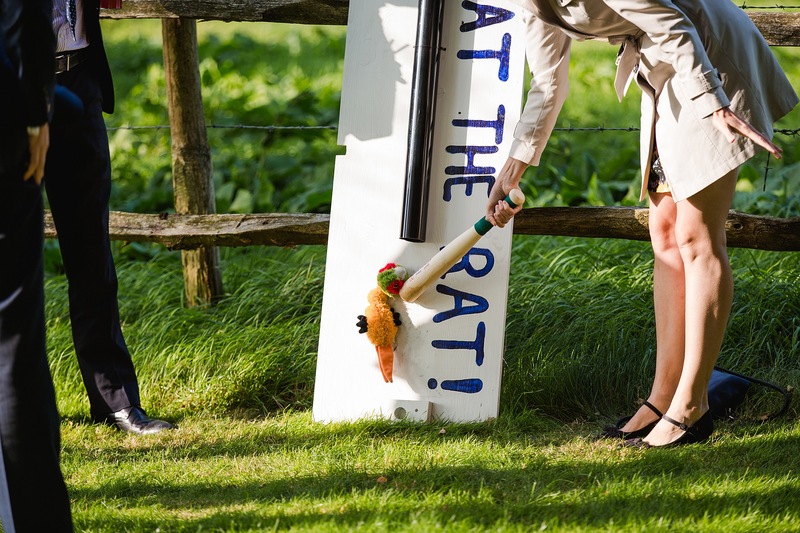 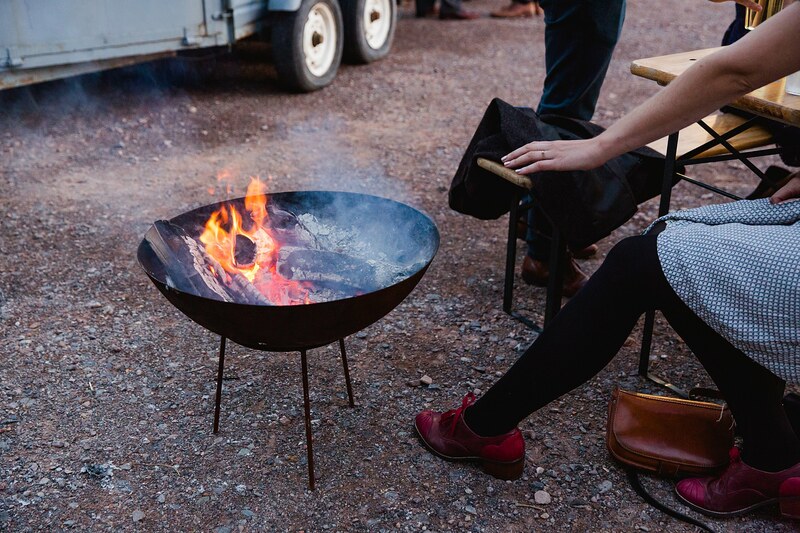 Guests could try their hand at welly wanging, tossing the horse shoe, giant noughts and crosses and splat the rat, as well as enjoy an assortment of fun looking props at a DIY photobooth. 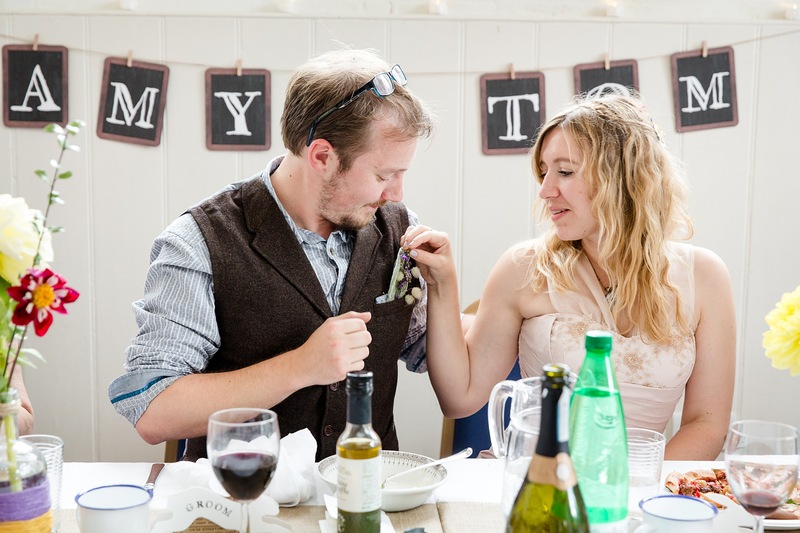 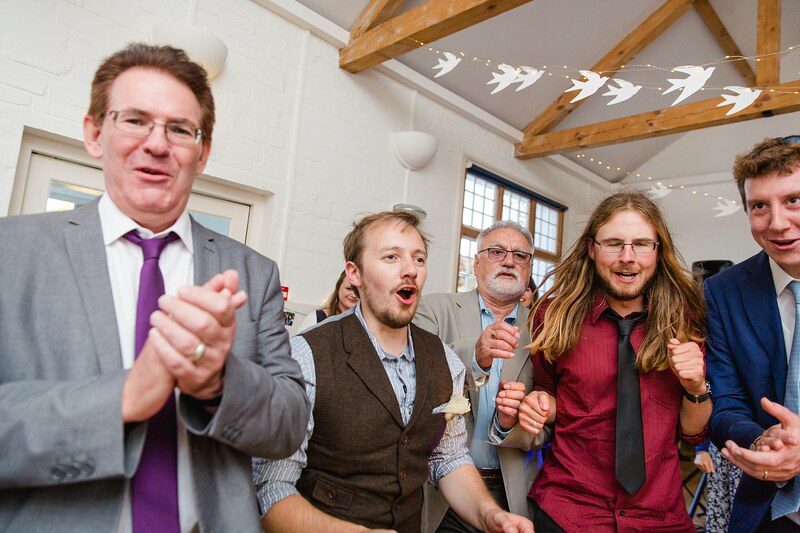 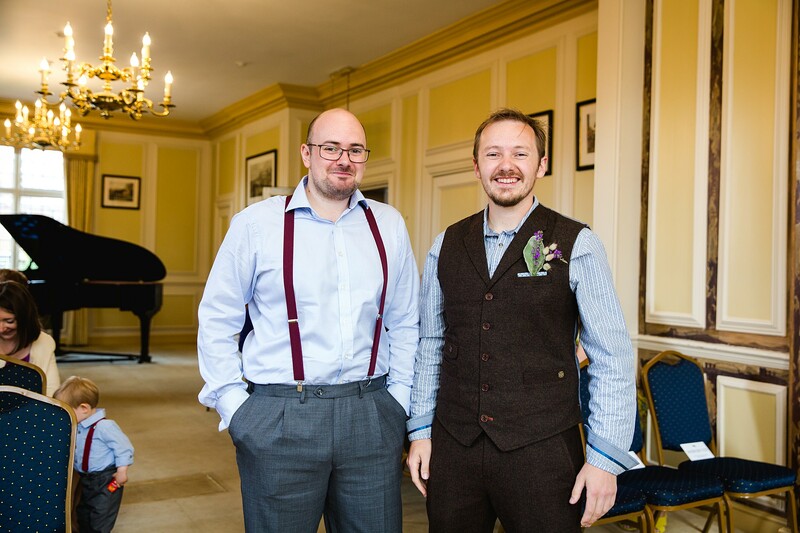 Oh, and if you’re wondering why that’s a trowel by the wedding cake….Tom is an archaeologist! 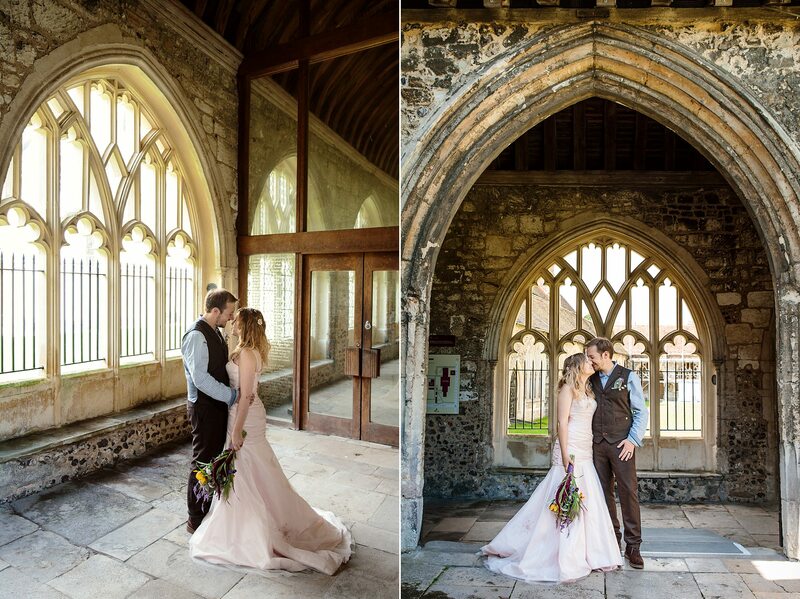 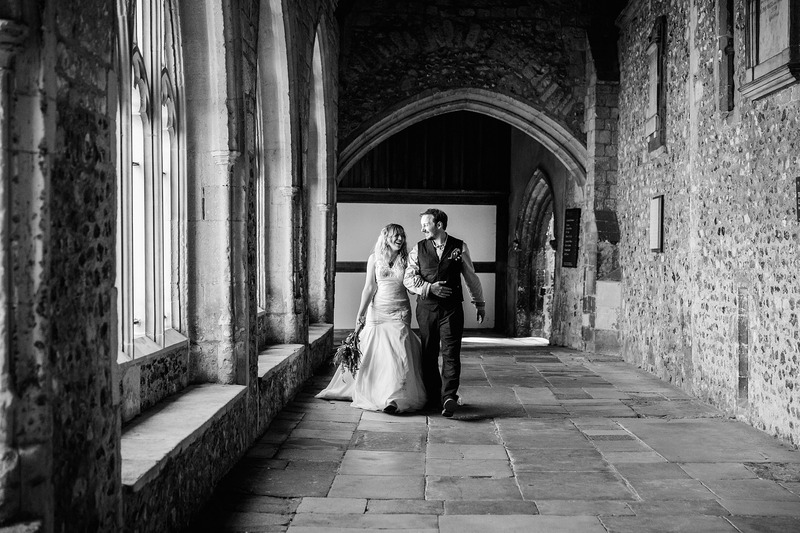 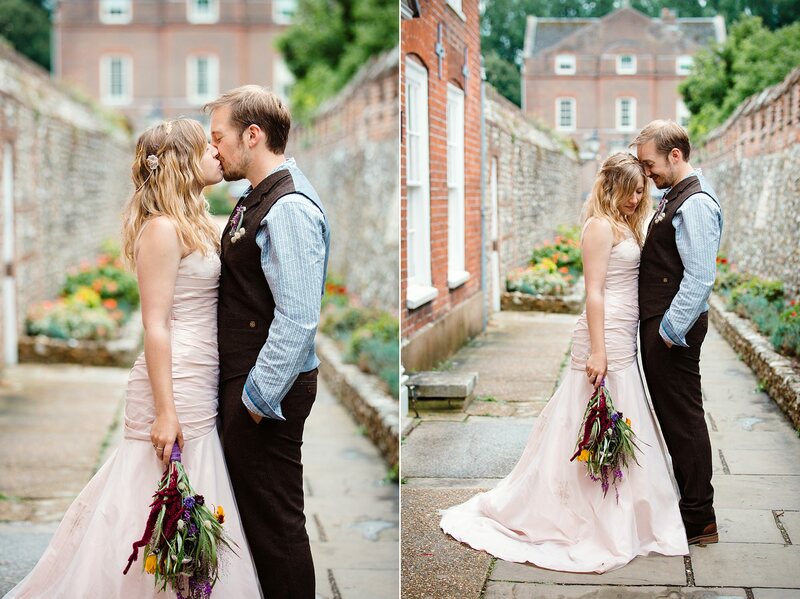 Amy and Tom were married at Edes House in Chichester (supervised by a portrait of the Queen) and since they had a super laid back day planned, we had loads of time for portraits in Edes House and the Chichester Cathedral cloisters across the road – we even made a stop off and had a lovely cup of tea just the three of us together at the Cloisters cafe. 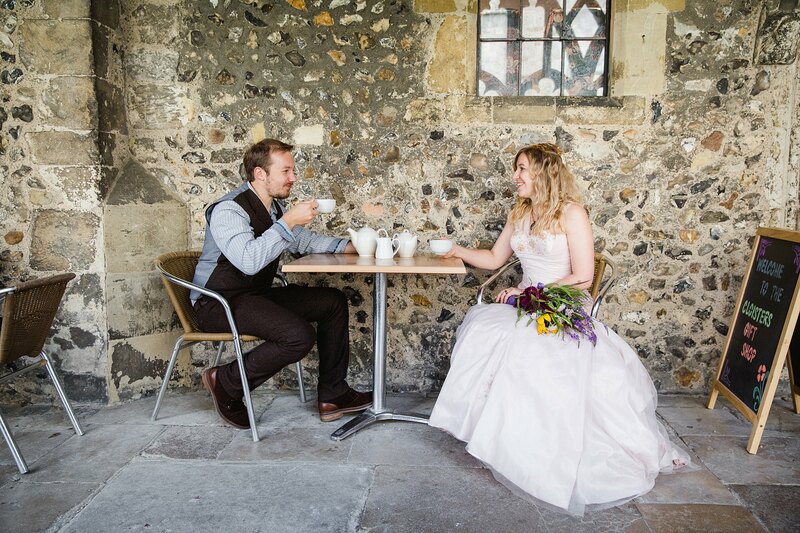 I think it’s literally the first time I have ever had an actual tea break at a wedding, was great! 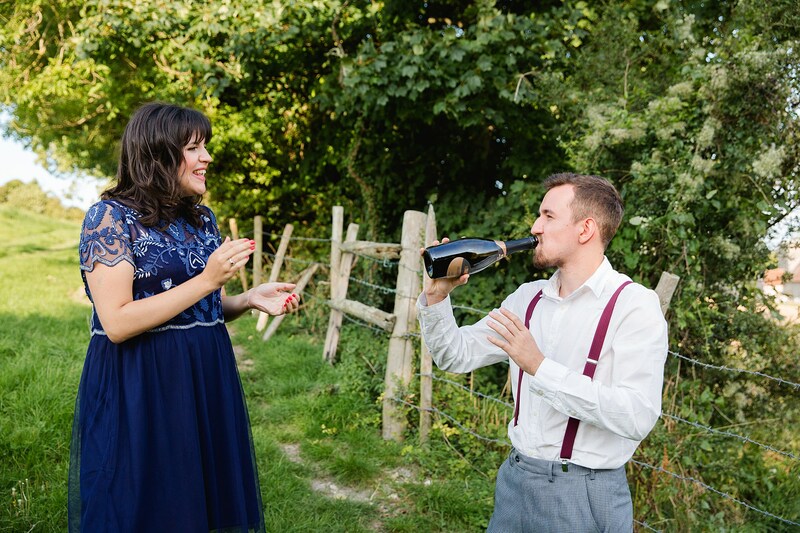 Amy and Tom were adamant they didn’t want any formal bridesmaids and groomsmen photos, so I suggested we just took a bottle of champers and climbed a nearby hill with the wedding party for a few quick laid back photos together – no formal posing, just friends hanging out and discussing who was likely to get the most drunk! 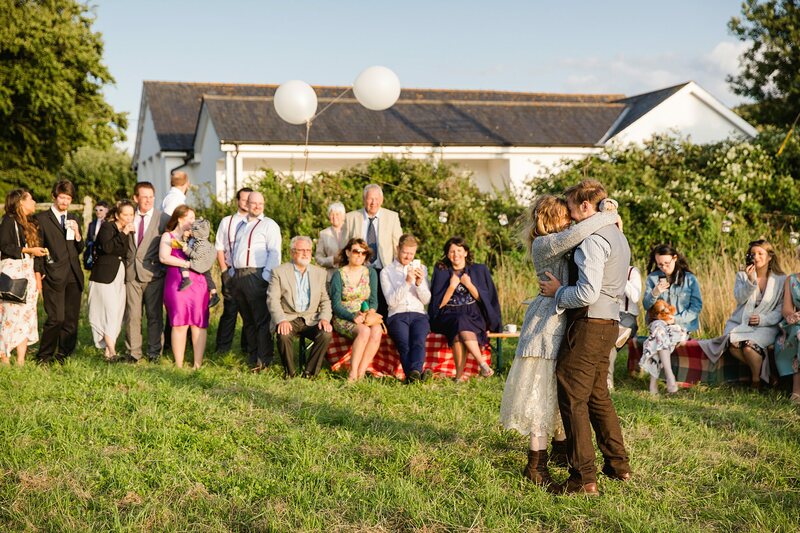 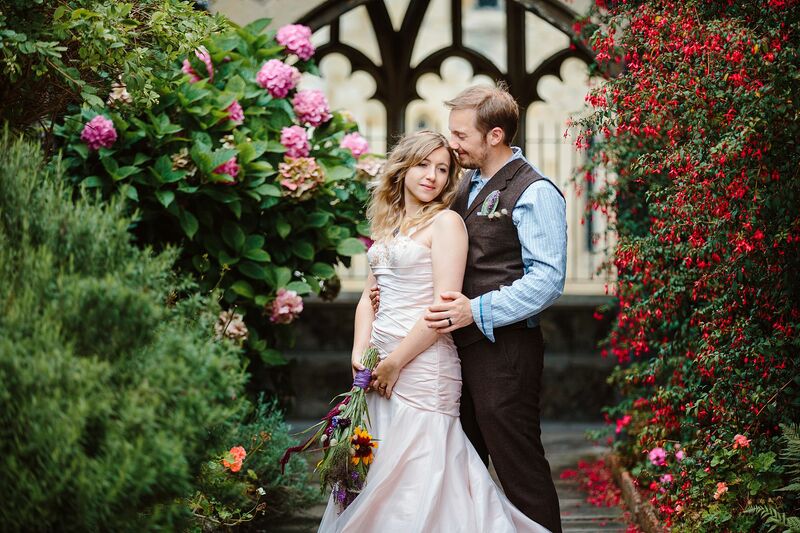 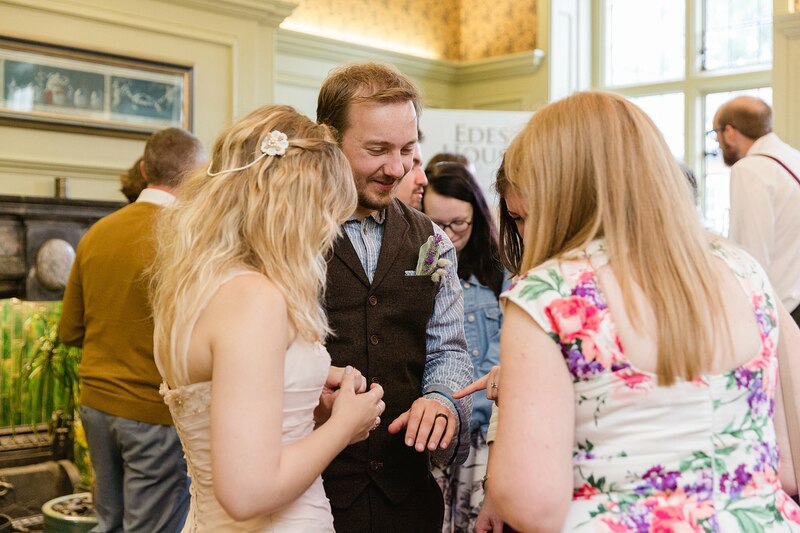 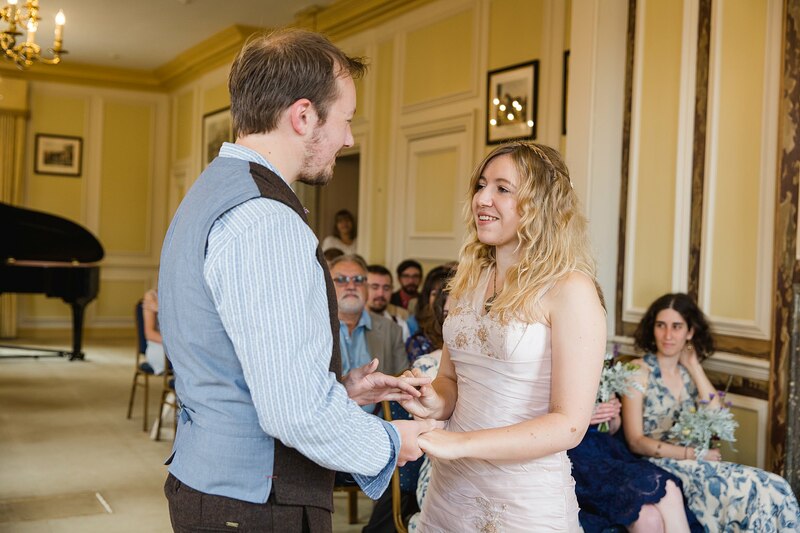 With it being a summer wedding, Amy and Tom were able to have their first dance outside, before heading inside for more fun dancing in a ceilidh and a pop up cocktail van. 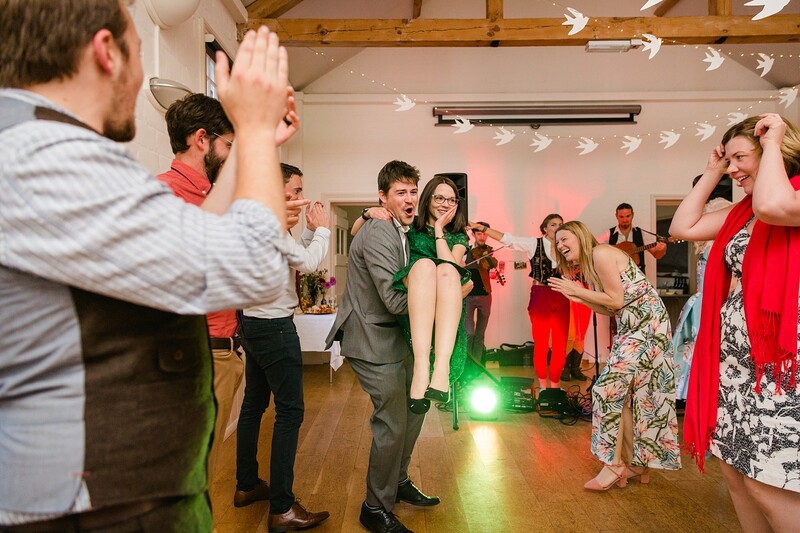 Amy and Tom wanted nothing but a laid back and fun village hall wedding, and they certainly delivered, I had just as much fun as the guests, so thanks guys for having me!